Retro flavoured kopitiams and eateries are plenty in Malaysia, where the good ol' days are still served up in good ol' ways, but a new breed of old-school coffeeshops are elevating nostalgia to the realm of designer vintage by turning the pleasure to reminisce into an artform. And paving the way is Ink Brew by JWC with the adjoining Eh He The Classic Accents Art House at Johor Bahru's heritage district of Tan Hiok Nee. Discovering Ink Brew and Eh He was something of a beautiful serendipity. We were poking our noses into an oddstentatious (odd and ostentatious) shophouse facade at the mouth of Jalan Tan Hiok Nee, unsure of what to make of it when an uncle seated in a kopitiam opposite encouraged us to go in. 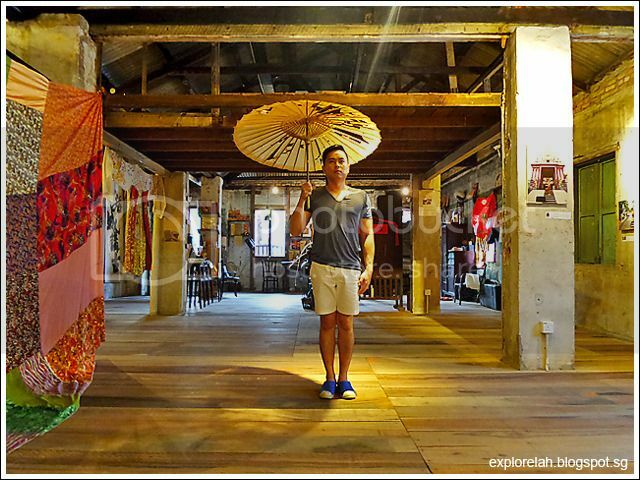 As we stepped through the doors of Eh He, thinking it's a performance arts theatre, we soon realised it is actually an art gallery embalming the Chinese history of Johor Bahru (JB). Beyond the gallery is a door that links to Ink Brew where the founding spirit of the precinct is translated into the cafe's menu and its deco. The result is a kind of retro that exudes effortless authenticity and bespoke artistry to entice not just the palate but hold the senses spellbound. Coffee with a story. 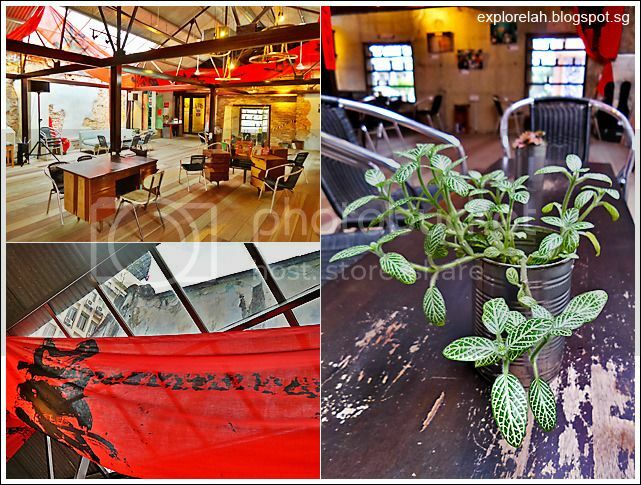 Sipping a cuppa at Ink Brew is not just about the caffeine fix but appreciating the philosophy that went behind crafting the concoctions. 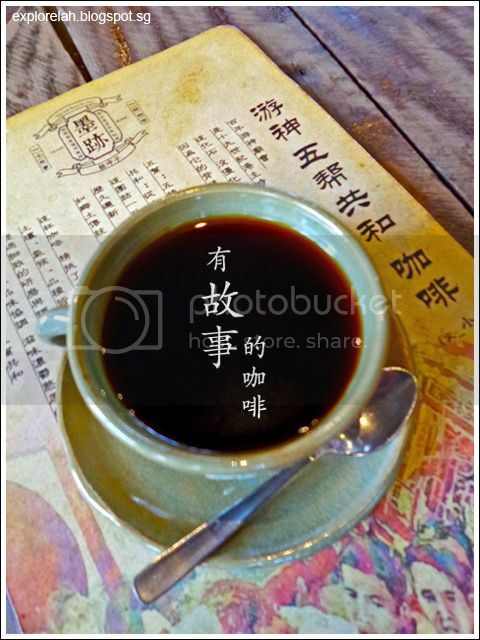 This brew is called "游神 - 五帮共和" ("Parade of the Gods - Five Tribes Unified") and is made from 5 different coffee beans. 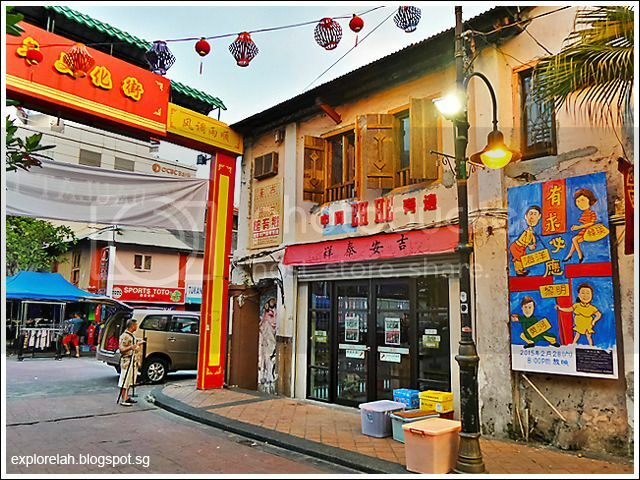 In the early days, 5 prominent ethnic groups from China settled in Johor Bahru. They are the Hokkiens, Hakkas, Teochews, Cantonese and Hainanese. As they hail from different sects, constant feuds and territory wars ensued, often with bloody consequences. To unify the fragmented dialect groups, the Parade of the Gods was created in JB so that the 5 groups may be unified through religion. As a homage to honour this history of JB, Ink Brew signatured this 5-beans-brew to remind drinkers that differences is the essence of a flavourful unified existence. RM15.00 (hot), RM16.50 (cold). At first glance, Eh He and Ink Brew which opened in March 2015 may seem like just another business trying to milk the appeal of nostalgia but that's just the superficial. I had the good fortune of meeting Pauline, one of the establishment's owners, and got a behind-the-scene understanding of the thought processes that went into realising every aspect of the gallery and cafe's design, spatial planning, and curated heritage within the premises. I came in not knowing I had a thirst and left with a hunger fulfilled. Eh He The Accents of Art gallery and Ink Brew by JWC can be accessed by different entrances but they are linked. Eh He's entrance is at the mouth of Jalan Tan Hiok Nee while Ink Brew's entrance faces Jalan Ibrahim. But the 2 are joined by a door on the second level so it doesn't matter which entrance you get in. For the ease of explaining how to get here, I'll use the Jalan Tan Hiok Nee entrance of Eh He as a point to direct wayfinding. Jalan Tan Hiok Nee is a short historic street in Johor Bahru that's somewhat like Singapore's Haji Lane where pre-war shophouses occupied by avant garde fashion boutiques, restaurants, cafes and heritage businesses congregate to create a blast-from-the-past lifestyle destination within the city. Entrance of Eh He The Classic Accents Art House gallery at the mouth of Jalan Tan Hiok Nee heritage street. 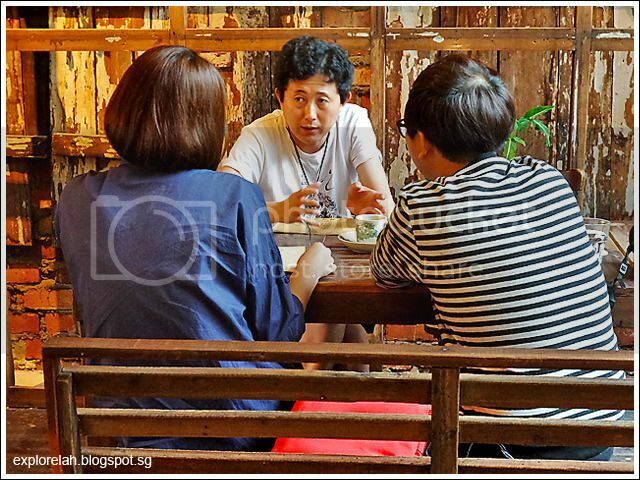 Opposite Eh He's visage is Kin Wah kopitiam that serves up traditional Hainanese coffee and kampung chicken's soft-boiled eggs. If you are coming from City Square shopping mall after clearing the Malaysian customs, look for the exit to Jalan Wong Ah Fook. Walk along Jalan Wong Ah Fook in the direction of the huge Hindu temple, Sri Raja Mariamman. Behind the temple is a street called Jalan Trus. 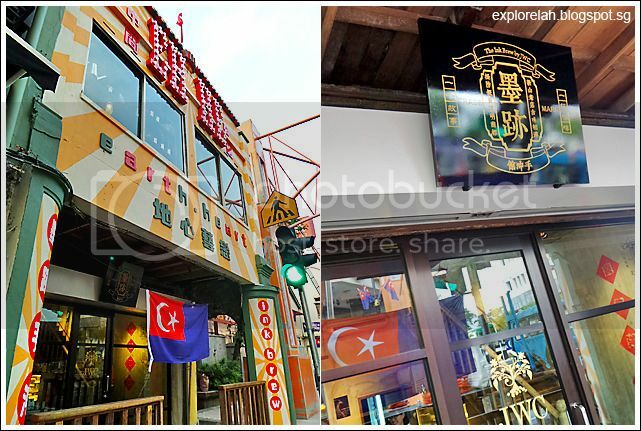 Walk along Jalan Trus which leads down the city's unofficial Little India and towards JB Bazaar and you will come to the entrance of the Tan Hiok Nee Cultural Street. Eh He's entrance is facing the start of Tan Hiok Nee Cultural Street (photo above). If you are unsure of your way, ask for directions to Sri Mariamman Hindu temple or Jalan Trus or Jalan Tan Hiok Nee along the street. Most locals would be able to point you in the right direction. It should take no more than 15 minutes to walk from City Square mall to Jalan Tan Hiok Nee at a leisurely pace. Entrance of Ink Brew with the prominent Eh He frontage on Jalan Ibrahim. 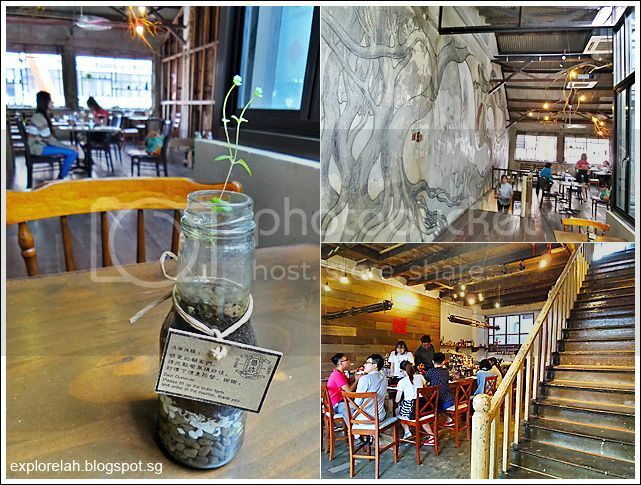 The shophouse that accommodates Eh He and Ink Brew is sandwiched between Jalan Tan Hiok Nee and Jalan Ibrahim. Eh He is an unconventional name for a gallery but there's a quirky rationale behind it. "Eh He" is derived from Earth Heart, meaning that art is all around us on this earth and also residing within us. If you look at Eh He's logo, you will also notice the words "中间" (middle) and "旁边" (to the side), which allude that art is at the heart of our being while at the same time, surrounding us. In addition to "Eh He 中间\旁边", there's a red banner that reads (from right to left as in the way that olden Chinese texts are read)　"吉安泰祥". For a moment I'm confused by the presence of so many phrases, making the sign seem more like a thesis rather a shop name. But after some explaning by the owner, I finally understood that 吉安 (ji an) is the name of the chief artist of Eh He gallery while 泰祥 (tai xiang) is the name of the business that used to occupy the shophouse. Stepping through the entrance of Eh He is like stepping into a time machine. 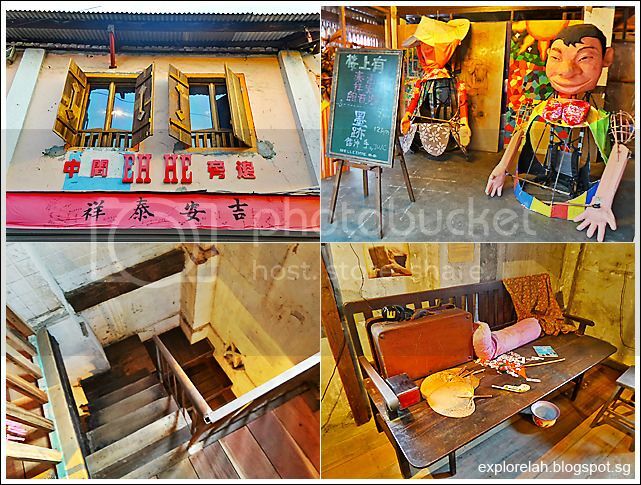 The first floor reception has 2 huge puppets and to the side is the original narrow stairs of the old shophouse that leads to the second level. The second level of Eh He The Classic Accents Arts House. There's an old world charm about this place that's immediately captivating. A photo on display at Eh He art gallery. 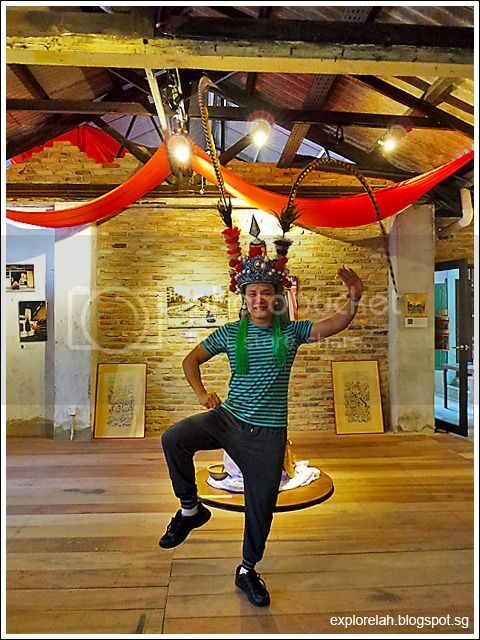 The man in half wayang drag is 张吉安 (Zhang Ji An), a radio personality in Malaysia and artistic director of Eh He. 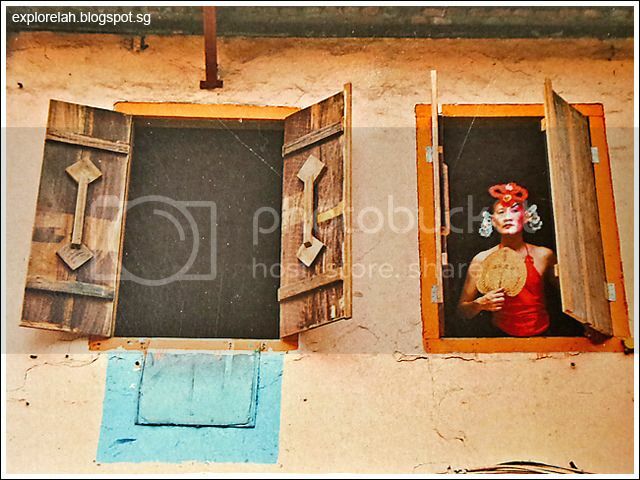 Ji An did a series of photoshoots with his opera persona around different places in Johor as a reminder that where we are and where we are heading are rooted in our heritage and traditions. Modernity may have eroded the visibility of traditions but our distinct cultures live on. 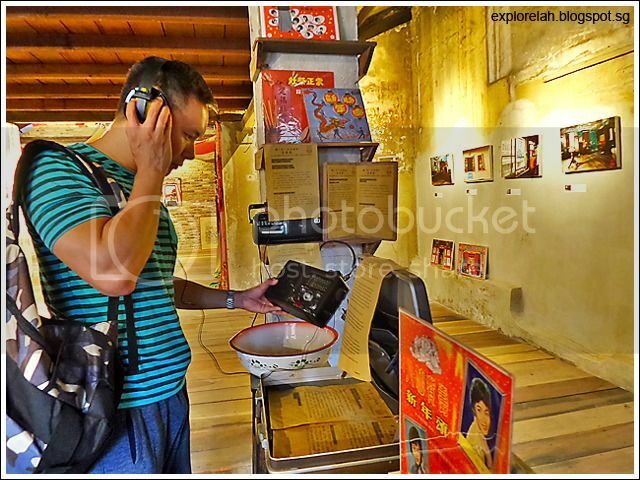 There are listening stations around Eh He gallery where you can tune in to yesteryear operas and conversations spoken in the purest form of the various dialects in Johor Bahru decades ago. I love the retro transistor radios used for the listening stations that come with a USB port where you can just plug in a MP3 and play. It's an old shell with a new soul. Surrounded by artistry in the gallery, we attempted to create our own photographic 'art'. Haha. The best thing I like about Eh He gallery is the absence of "Do not touch" signs on its exhibits. There's no barrier to interact with the heritage artefacts to really feel them. But please handle with utmost care as many of these historic memorabilia are at the brink of falling apart. 刀马旦。Rekindling the days where I learnt and performed Chinese opera in my late teens. But mostly as a backdrop character. LOL. Behind me is the door that leads to Ink Brew by JWC cafe. ... an unconventional sitting area that defies the usual set-up for a cafe. But I didn't think it was a cafe at first, and thought it's the make-up room for performance artistes who may put up shows at Eh He gallery. 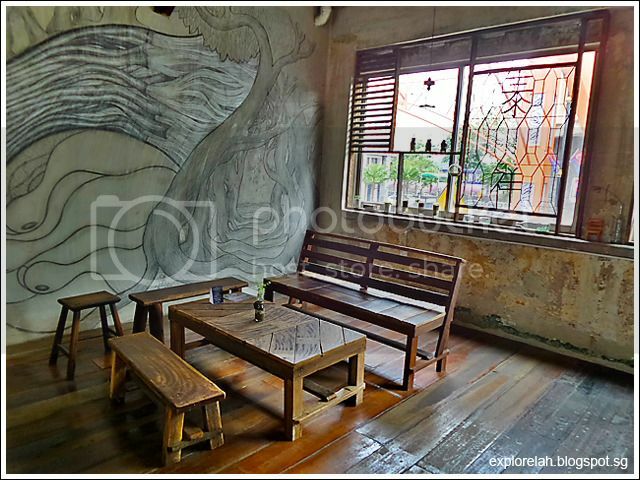 But this is the extension of a sitting area for Ink Brew cafe. There's a lot of room to breathe here amongst salvaged vintage desks and authentic dressers that hail from the 70s. I immediately felt at home as one of my aunties used to have a wooden vanity dresser just like the one found here! The walls surrounding the hall are the original structure of the old shophouses and you can see that some parts are not aligned in a straight line due to aging. 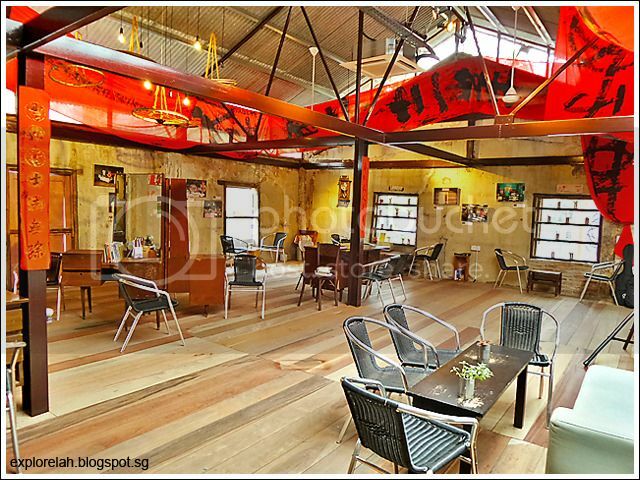 The red calligraphic scroll encircling the ceiling is done by a renown calligrapher in Singapore as a gift to the cafe. And if you peer through the skylight, you will see a hump on the shophouse's roof that has been retained. The hump is a classic Hainanese (I think) architectural feature that represents the mountain. In Chinese culture, having a house with a mountain at the back is good fengshui as it signifies that the household will have a solid backing in whatever it's inhabitants pursue. Another door at the side of the sitting area above leads to a wholly different sitting space of Ink Brew with a stairway leading to the ground floor where the barista, cashier and kitchen reside. Renovating the interior of the dilapidated shophouse took an arduous 4 months where many of the original building materials were retained. The side wall of the cafe is exactly as it has been while as much of the original floor boards have been rescued and reuse. 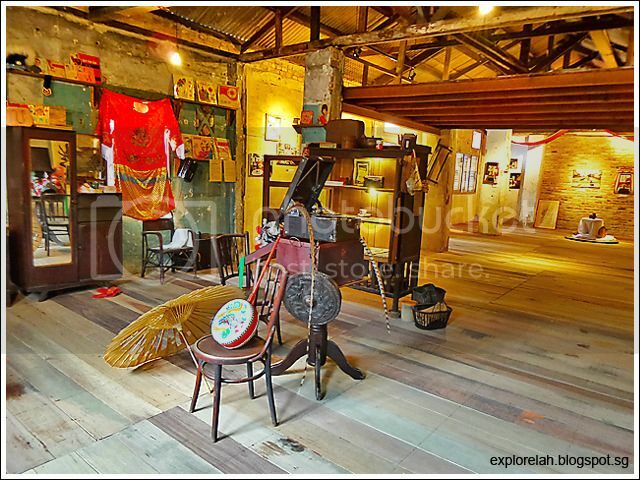 That explains the 2-colour tone of the wooden floor with the darker flooring being the original wood found in the shophouse and the lighter colour being add-ons because not all floorboards can be salvaged. I love how they try to recycle and 'artify' the old into the new. Furniture at Ink Brew is also an inconsistent carpentry of tables and benches as they are made from salvaged wood at the original shophouse. 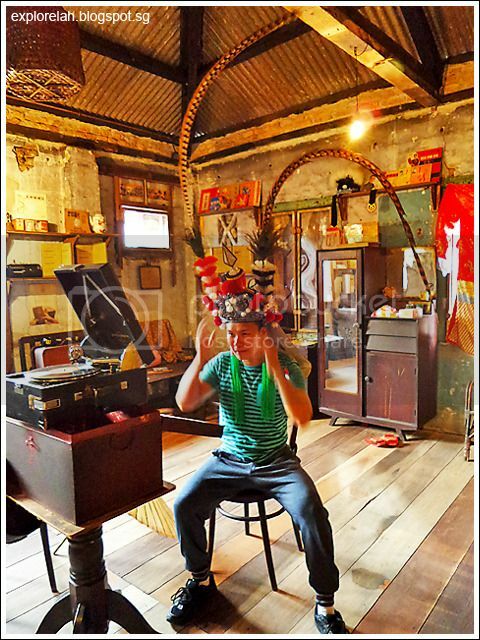 What you are sitting on is a piece of Johor Bahru's history while you sip tea or coffee. 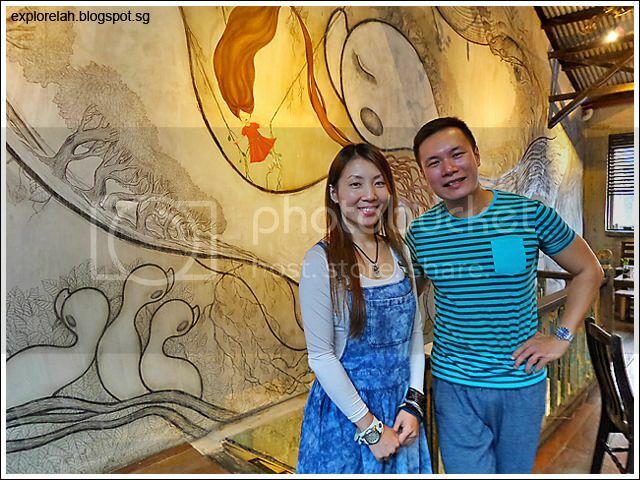 Here with Pauline See, the artist behind the massive wall mural at Ink Brew cafe. Her work behind us is titled "Temptation", which she alludes to how as children, we have ambitions and aspirations but as we grow up, we succumb to temptations that thwart the pursuit of our dreams. She also shared that her artworks typically feature 3 colours - white to represent the aspirations and goodness that humanity possesses; black as a symbolic colour of the dark side or secrets that we don't want people to know; and red as the mark of breakthrough and creativity we have in us to make a difference. What's not pictured here are flying whales near the roof which represent innovation, that we have the ability to break-free from our paradigms with courage and a readiness to adapt to new environments. A staff sharing the stories and rationale behind the drinks and food items on the menu. I was so amazed by the casualness and enthusiasm of staff members taking the time to sit down and explain the concept behind the coffees, mocktails and food that they serve. Drinking coffee at Ink Brew by JWC is an art of savouring the painstaking thought processes that went into creating the signature brews. 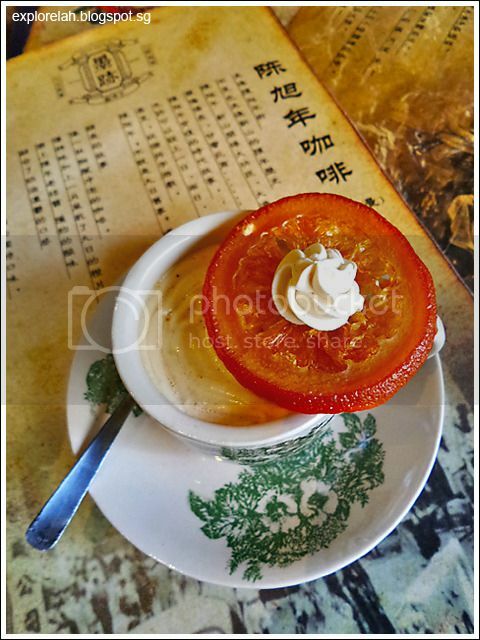 Pictured here is 陈旭年咖啡 (Tan Hiok Nee Coffee). This cuppa is not created because the cafe sits on Jalan Tan Hiok Nee but a taste journey of the forefathers' effort to build Johor Bahru. If you look at the Chinese word 旭 (xu4), it consists of the characters 九 (jiu3, nine) and 日(ri4, day). So the orange slice on the coffee has actually been sun dried for nine days. To truly enjoy this caffeine creation, you have to first put a bit of the cream in the mouth and drink the coffee. Then, take a bite of the orange slice and drink the coffee again. Lastly, submerge the remaining orange slice in the coffee, let it steep, and drink the brew again. What you would taste is first bitterness, then an acidic sour flavour, followed by a sweet ending. This represents the 苦尽甘来 (joy after hard work) spirit of the early settlers where the virtue of being hardworking is rewarded with the fruits of the labour. This story coffee doesn't come cheap though. It costs RM16.80 per cup. Other than coffees, there are some taste innovations that are worth checking out. 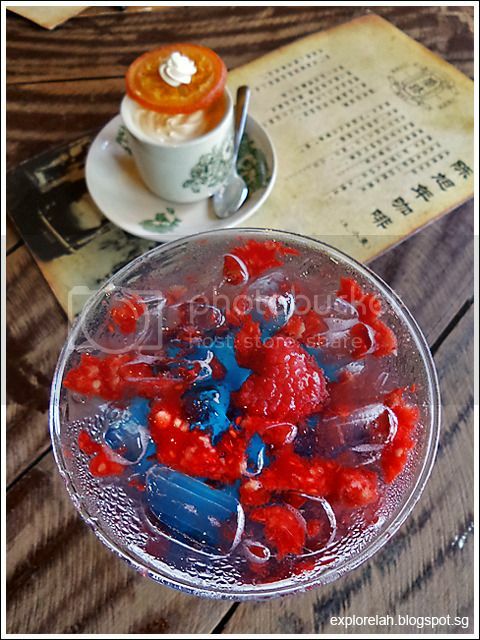 We love this mocktail called 小梦的天空 (Sky of a Little Girl, RM13.50) that features 泡泡糖 (crackling sweets). Every sip is a trip back to my childhood where these sweets crackle and come alive on my tongue! As the crackling sweets are kind of extinct on the streets, Ink Brew went through a lot of research to find a supplier. Food is also on the serve. We ordered this pizza called The Garden (RM15.90) that has been designed by a nutritionist. 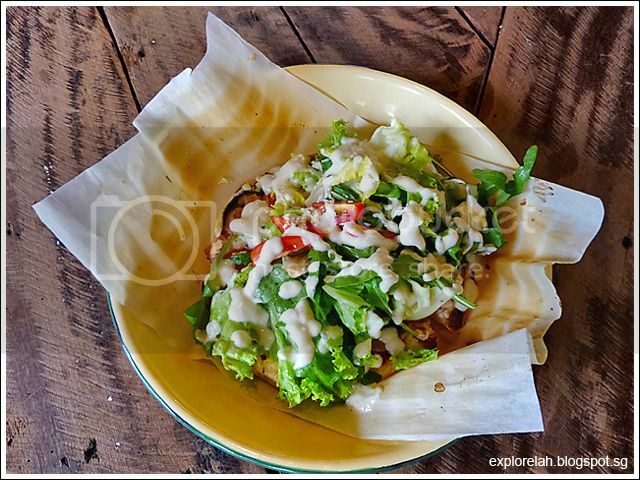 It contains a lot of veggies on a thin pizza dough with the suace made from tofu. It's mild in taste but somehow you don't feel the guilt of gluttony. I just had a bowl of curry noodles, 2 soft-boiled eggs, and a slice of banana sponge cake before eating this! So tam jiak because the items on Ink Brew's menu sounds so exotic. 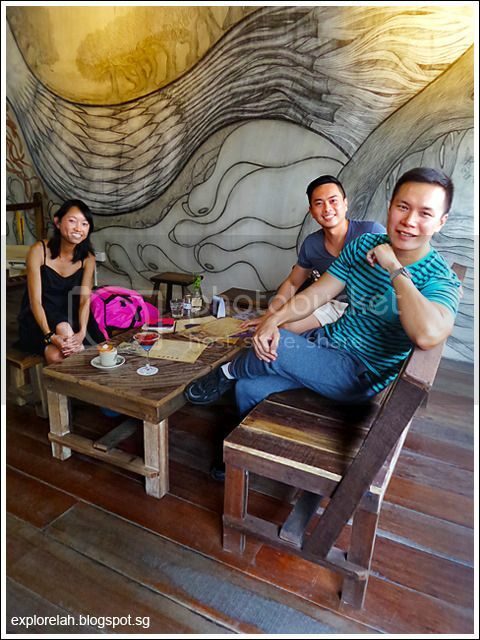 We didn't plan on sitting down to have a coffee but the unusual vintage charm of Ink Brew compelled us to rest our feet with a step back into the past. 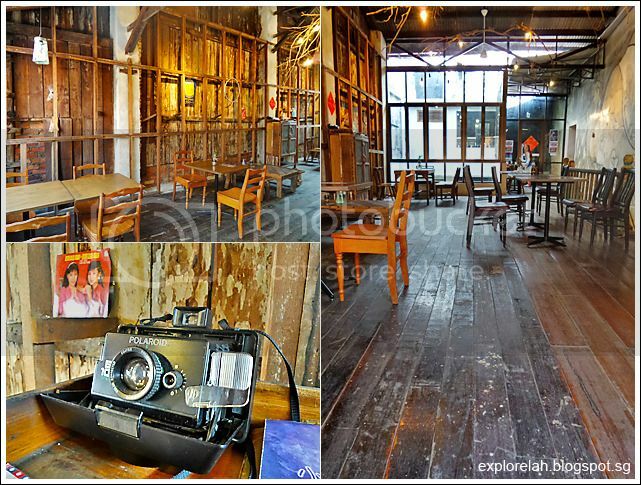 While prices aren't cheap at Ink Brew for the drinks, we find that Ink Brew and Eh He is totally worth checking out for the ambience, artistry, creativity and thoughtfulness that went into preserving this shophouse on Jalan Tan Hiok Nee and Johor Bahru's culture!